Terence R. Duren was a leading Nebraska artist during themid 20th century. 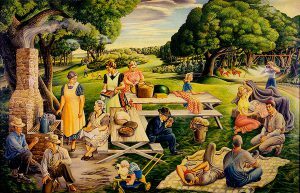 Duren, who lived most of his life in Shelby, Nebraska, is most widely known for his regionalist works, which drew on his rural Nebraska upbringing. Duren began to paint when he was stricken with polio at age six. To occupy their bedridden son, his parents gave him crayons and a tablet. In an interview shortly before his death, Duren said he realized then that he would be an artist. After graduation from high school, he went on to study art at The Art Institute of Chicago, the École des Beaux Arts in Fountainebleau, France, and the Kunstgewerbe Schule in Vienna, Austria. During the 1930s, Duren taught at The Art Institute of Chicago, the Cleveland Institute of Art, and at Western Reserve University, Cleveland. At the start of World War II, he returned to Shelby, but continued to exhibit work in major art centers around the country. Duren’s career and reputation reached a zenith in 1944 when one of his paintings was chosen for Portrait of America, an exhibition which opened at the Metropolitan Museum of Art in New York and toured to eight museums across the country. Among his other projects, Duren designed sets for an opera company in Cleveland, as well as the sets and costumes for a marionette production of “Peer Gynt” at the New York World’s Fair (1939-1940). He was a prolific illustrator whose work regularly appeared on the cover of the “Magazine of the Midlands,” the Sunday supplement of the Omaha World-Herald. The Museum of Nebraska Art holds 22 works by Terence R. Duren.